vijayjohn wrote: How'd the first consonant there end up being voiced? Hyperforeignization? Oh, that's a feature of (old) Helsinki slang. I've not read about why they did it, but it's done in quite a few words. [flag=]it[/flag] Not counting those listed in the Wikipedia article linked by Car. fast food - fast food restaurant. take away - take away / take out restaurant. pendrive - USB flash drive. top model - fashion model. out out* (misspelling of aut aut - Latin expression meaning either… or…) - ultimatum. spread - Bund-BTP spread, i.e. the credit spread / yield differential between German and Italian bonds. spending review - euphemism to mean "financial cuts by the government". English meaning: "Baggy" and "slim" are mainly adjectives, and "slim" is never used in reference to skinny jeans. But: slim fit. Or is it not used in English-speaking countries? In Italy you often see slim as a commercial jargon for thin-shaped objects, like phone covers, small-sized portable hard disks, etc. I think many languages borrow sports names delete the -ing. In Chinese I would distinguish two categories: one for anglicisms used in Chinese, and one for English terms used in English here, including official translations. VCR (wēi sēi àr) - videoclip (usually introducing a person, especially in reality shows). PS / P (from Photoshop) - to manipulate photos, not necessarily using Photoshop. PO (pōu) - to post (on the Internet). pass - ambiguous: either to pass an exam or a selection (as a student/candidate); or to reject / pass to the next person/thing (when acting as the interviewer or when choosing things). push - to push / pressure sb into doing something; or as an adj: very demanding / pushy / pressuring person (e.g. parents, boss, professor). 脱口秀 (tuō kǒu xiù) (from talk show) - meaning both talk show and stand-up comedy. This is incorrect. It actually comes from the online games, from the expression "player kill", i.e. when two players fight each other until one of them dies. Nowadays it means "challenge, competition". Also used as the equivalent of "vs". CV - résumé (the Chinese format is closer to the American résumé than to the British curriculum vitae). beancurd (one word) - bean curd, tofu. BBQ pork - char siu. pickle - any pickled vegetable. Chairman - Chinese president. In older translations, 主席 was translated in English as Chairman, while President was considered the translation of 总统. E.g. Chairman Mao. unit - word used to translate 单元 or 座, the subdivision of a building or block of apartments accessible by a staircase. mansion - 大厦, a highrise consisting of offices or apartments. school - 学院, department of a university, or college constituting a university. college - 学院, either same as "school" above or a university institution with only one "college". Wikipedia wrote: ABC – American-born Chinese, also CBC = Canadian-born Chinese, BBC = British-born Chinese, etc. This looks like jargon used by the ethnic Chinese, especially the English-speaking ones, and also other Asians, worldwide. In fact, it seems it's not understood by non-Asians. Another example of Asian jargon is hapa, meaning a person of mixed ethnicity, half Asia, half non-Asian. Last edited by OldBoring on 2016-08-05, 5:18, edited 5 times in total. "Slim fit" is used, but slim fit jeans aren't the same as skinny jeans. Slim fit is lightly form-fitting, but not tight. Skinny jeans are tighter. The clearer the outline of the wearer's thigh or calf, the more likely it is you're looking at skinny jeans. Skinny jeans also have less give around the ankle. Compare this (slim fit) and this (skinny). Mitingas - Mass meeting to discuss political matters, from "Meeting"
Fainas - Good looking, fine, charming, cute. Origin - "Fine". This one is considered to be a jargon, but is so commonly used, I never realized it came from English. Forsas - something like "chav" in England. Origin "Force"
Autsaideris - Outsider. Also, one of the worst teams in sport competitions. I mean, it's just the way youth speaks, just like in every other country. When we get tired of these long and silly Lithuanian words, we tend to use English words that are much easier to use. This Lithuanian-English mash-up occurs especially often in gaming culture. When I used to talk to my Lithuanian gamer friends, the vocabulary was more of a Lithuanized English than Lithuanian. Dormouse559 wrote: "Slim fit" is used, but slim fit jeans aren't the same as skinny jeans. Slim fit is lightly form-fitting, but not tight. Skinny jeans are tighter. 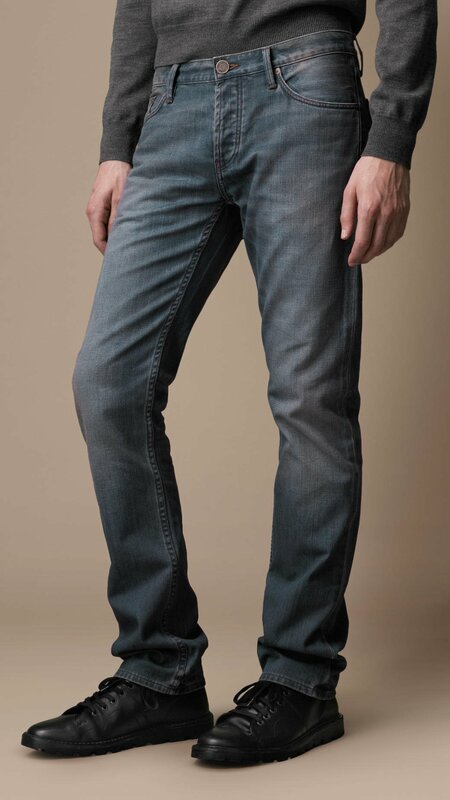 The clearer the outline of the wearer's thigh or calf, the more likely it is you're looking at skinny jeans. Skinny jeans also have less give around the ankle. Compare this (slim fit) and this (skinny). I guess I don't shop for jeans often enough. And slim fit jeans are probably already very tight for me that I struggle to put them on. Italian online game players also say "killare" or even "killerare". They also say "uppare", to mean: gain experience points, get up in level. OldBoring wrote: Another example of Asian jargon is hapa, meaning a person of mixed ethnicity, half Asia, half non-Asian. IIRC, this same word is used in Hawaii to mean a person who is half white and half Hawaiian (a.k.a. hapa haole, haole being the term for a white person) in English, Hawaiian Pidgin, and Hawaiian. English meaning: "Top" is used adjectivally in things like "the top 10", but French has extended that usage to the point where you can say literally "That is really top". English meaning: Usually just the plural of "person". English meaning: "Scotch" on its own mainly refers to a kind of liquor. Yeah, I think we got that term from them. In Italian too. But scotch can mean any type of adhesive tape, not necessarily Scotch tape. I use the verb scocciare to mean "apply tape to", but not everyone understands me. It's probably modern Rome slang. Last edited by OldBoring on 2016-07-20, 8:15, edited 1 time in total. OldBoring wrote: In Italian too. But scotch can mean any type of adhesive tape, not necessarily Scotch tape. Likewise in French. It's just that "Scotch tape" is a general term in English, too. "Adhesive tape" makes sense to me, but it's not what I'd say casually if I had to differentiate it from other kinds of tape. "Adhesive tape" sounds to me like a pure commercial term. "Tape" is assumed adhesive unless the context forces a specific different interpretation (e.g. "We got it on tape" = "We recorded it [audially or visually]"). Still lolling whenever anyone says "tape" in the latter context on Star Trek, a show set three to four centuries from now. "Scotch tape" isn't really a genericized term. It's a specific kind of tape, different from masking tape. Isn't it? As opposed to masking tape or duct tape. (Of course there are other types of tape, too, but I probably deal with them so rarely I don't even know what to call them yet besides just "tape"). mōdgethanc wrote: "Scotch tape" isn't really a genericized term. It's a specific kind of tape, different from masking tape. Isn't it? Legally, it's not a generic term, but practically speaking, it is. IME it refers to any kind of clear adhesive tape which comes in a dispenser and whose primary use is affixing paper to itself or other smooth surfaces. If I asked you for "Scotch tape" and you handed me a roll of Sellotape or Tesa, I wouldn't bat an eyelid. I remember some dictionaries translating scotch as sellotape. Maybe Scotch tape is the generic term in North America, and sellotape in British English. For me scotch (with its Italian synonym nastro adesivo) includes both those small transparent tapes to stick paper or those big ones usually used to stick boxes, that are usually transparent or yellow. But it doesn't necessarily come with a dispenser. Or rather, they are most often sold separately. I had no idea adhesive tape was not common in English. In Italian adesivo just means sticky, and nastro adesivo is considered the "proper term" for scotch tape. OldBoring wrote: I remember some dictionaries translating scotch as sellotape. Maybe Scotch tape is the generic term in North America, and sellotape in British English. Or maybe it's just that sellotape is pretty common here, too, and it matters to them about as much as linguoboy mentioned it mattering to him. OldBoring wrote: I had no idea adhesive tape was not common in English. In Italian adesivo just means sticky, and nastro adesivo is considered the "proper term" for scotch tape. Now that you mention it, I've heard "sticky tape" before, but for me this is one of those curious things old people say like "icebox" or "pizza pie".